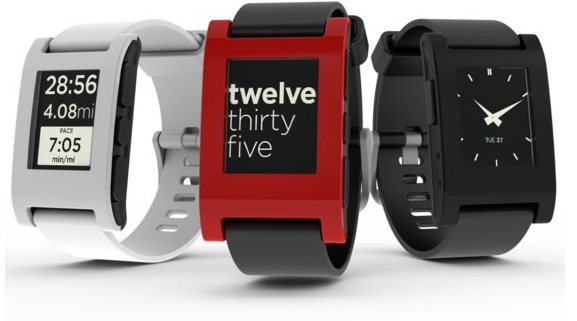 Not content with hitting $1 million of funding in just over one day, Kickstarter project Pebble has broken the record for funding on the crowdsourced site with a whole month still to go. The project to create a slick e-paper smartwatch that connects to iPhone or Android has now passed $3.3 million — thanks to just over 23,000 backers — having rightly gained a lot of attention since first appearing on the service. The Pebble is a slim, attractive watch with an e-paper display and a battery life of 7 days, the lens is scratch resistant and it charges via USB. It syncs up to an iPhone or Android device, via bluetooth and a mobile app, to provide customisable alerts when the phone rings and email or messages are received. Pebble initially raised $1 million in 28 hours, easily surpassing its initial request for $100,000, and it looks set to give yet another glimpse of just how effective the platform can be for raising awareness and funds for promising projects. Pebble is the fifth project to pass seven figures of funding but it looks set to power on and set a record that is a long way past the previous best, set by games firm Double Fine’s $3.3 million haul. As we wrote right after funding for the video game closed, it was a game changer and Kickstarter has become a site that can rival VCs and other sources of revenue. More than that, however, it can potentially shift the balance of power in other industries, like the entertainment space, where social media has great prominence and large audiences. Can you imagine, for example, the potential it could have for an artist like Lady Gaga. If she could gain the backing of even 1 percent of her near 23 million Twitter followers, she would have an entirely independent revenue stream. For now though, we’ll stick to keeping an eye on Pebble’s continued growth as it is the latest marker in the sand for where crowdsourced funding is heading…and that’s a very long way, from where we stand.